Stunning and pioneering works in silver specially commissioned for the recent Victoria and Albert Museum exhibition, Silver Speaks: ‘From Idea to Object’ will be offered at Bonhams Decorative Art and Design Sale in London on 27 September. The exhibition, curated by design critic Corinne Julius, was organised by Contemporary British Silversmiths to mark its 20th anniversary and showcased the very best of British silver design and craft. Animus, a sculptured centrepiece by Kevin Grey estimated at £58,000-62,000. In the work Grey, three times holder of the prestigious Goldsmiths’ Company Crafts and Design Council award, uses cutting edge technology to explore the idea of a continuous revolving thought, which demands total absorption until the solution is found. He works directly with the material, making no preliminary drawings, but hand-forming strips of silver, TIG welding them together and confronting complex technical issues as they arise. Ice Windows, a bowl by Clive Burr with additional work by Jane Short estimated at £45,000-50,000. Inspired by childhood memories of the coast in wintertime, this intensely personal piece recalls hours spent looking out to sea, watching the ever-changing blues of the ocean and the sky and the gentle curve of the horizon. The bowl was spun into shape, with lines added mechanically, and the windows were enamelled by Jane Short. Waves by Nan Nan Liu, a sculpture estimated at £12,000-14,000. Reflecting her fascination with water and its unpredictability, Waves is one of a number of Liu’s works that demonstrate the appeal of shapes and repetitive patterns in nature. She works from photographs of moving water, then layers paper to create three dimensional forms before building up single layers of silver, allowing the form to assume a life of its own. 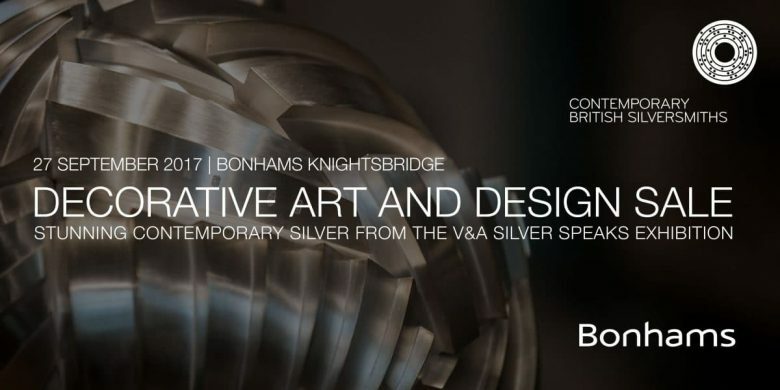 For further information and images call Laura Watts on +44 (0) 20 7468 8210, or email press@bonhams.com.